I'm sad about what I need to discuss today, here on Life with Lynnie (LwL). Was it mentioned here in Canada? Truly, I can't say. I didn't see it on our Canadian news. But, it may have been shown for a moment or less. I don't know. I may have missed it. I can tell you that bbc.com posted an article entitled, Egypt Coptic Christians killed in bus attack: http://www.bbc.com/news/world-middle-east-40059307. Did you click on the link? Did you read it? That article didn't really say much, to be honest. Here is a link for another article posted by msn.com entitled, Gunmen kill 26 in attack on Christians in Egypt: http://www.msn.com/en-ca/news/world/gunmen-kill-26-in-attack-on-christians-in-egypt/ar-BBByrvb?li=AAadgLE&ocid=spartanntp. CAIRO, May 26 (Reuters) - Gunmen attacked buses and a truck taking a group of Coptic Christians to a monastery in southern Egypt on Friday, killing 26 people and wounding 25 others, witnesses and the Health Ministry said. An Interior Ministry spokesman said the unidentified gunmen had arrived in three four-wheel-drive vehicles. 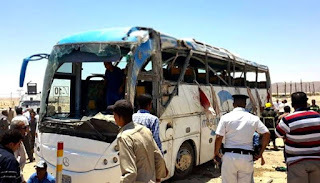 Eyewitnesses said masked men stopped the two buses and a truck and opened fire on a road leading to the monastery of Saint Samuel the Confessor in Minya province, which is home to a sizeable Christian minority. The grand imam of al-Azhar, Egypt's 1,000-year-old center of Islamic learning, said the attack was intended to destabilize the country. "I call on Egyptians to unite in the face of this brutal terrorism," Ahmed al-Tayeb said from Germany, where he was on a visit. President Abdel Fattah al-Sisi called a meeting of security officials, the state news agency said. The Health Ministry put the toll at 26 dead and 25 wounded. About 70 have been killed since December in bomb attacks on churches in the cities of Cairo, Alexandria and Tanta. Would you have wanted to be on this bus? Would you have wanted to be attacked? And/or murdered? I don't believe those Christians did. But, they were. Those of us, here on earth, need to pray and trust God to do what He can for us. Of course, we don't know His will for our lives. However, we need to be able to stand against anyone who is doing work for the devil. Like those Muslims did. Just as we read, in Ephesians 6:11, "Put on the whole armour of God, that ye may be able to stand against the wiles of the devil." In order to stand against the wiles of the devil, we need to put on the whole armour of God. After all, anyone who attacks like that is doing work of the devil. Satan. So, we need to be able to put on the whole armour of God, to be able to face them, fight them, and pray for them, even in non-dangerous situations. But, also if we are in dangerous situations where our lives may end. How can you figure out what the armour of God is? Read God's Word, the Bible. He'll reveal it to you.